Home > Law Books > Treatises > A Practical Guide to Document Authentication: Legalization of Notarized and Certified Documents, 2018-2019 ed. 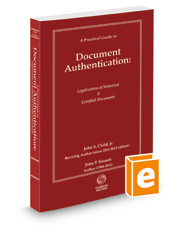 A Practical Guide to Document Authentication: Legalization of Notarized and Certified Documents, 2018-2019 ed. The book is a survey of the procedures used to authenticate or legalize documents in approximately 300 foreign countries, territories and states of the United States. It provides contact information required to request authentication, and the fees and time required to authenticate different types of legal documents, including powers of attorney, as well as commercial documents, such as invoices, certificates of origin, bills of lading, applications for incorporation, and trademark applications, plus educational documents (diplomas and college transcripts) and official records (marriage certificates, etc.). The book also includes copies of treaties that affect the procedures used for authentication of documents in various countries. The book has current information for countries affected by the Arab Spring (Egypt, Tunisia and Libya) and a newly formed country (South Sudan).